The 10 best Michelle Obama quotes on empowerment and leadership. Every quotation is followed by a thorough explanation of its meaning and how to implement her ideas. Discover lessons from Michelle Obama that can transform your life! 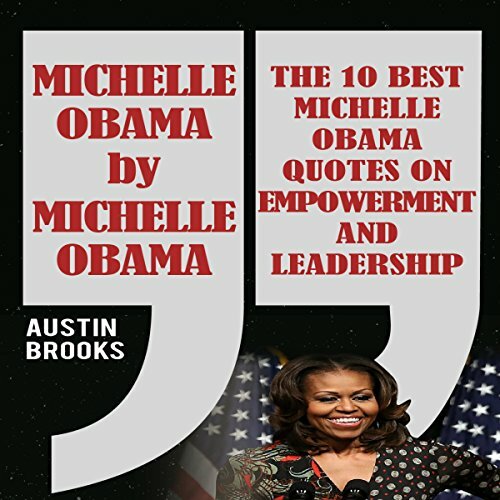 The first lady in her own words: 10 quotations analyzed to reveal the secrets of empowerment by the lady from Chicago's South Side. The story of Michelle LaVaughn Robinson Obama can't be reduced to the glamorous title of first lady of the United States. Michelle is a mother, a professional, a rock-solid woman who made her way through hardship and became one of the most influential women of today. She is proof of the American dream and an inspiration for thousands who wish to achieve it. In this book you will discover her best quotes on self-realization and get a fresh perspective on how to make the most of your potential, live a better life, and get one step closer to fulfilling your goals. These values and ideas can and should be implemented in your own personal and business lives. In this book you will find how it can be done.